Coconut Oil: Myth or Miracle? We have heard so many controversial opinions about coconut oil. Once and for all, is it a myth or is it really a miracle? I can imaging the Google searches now: "the effects of coconut oil", "is coconut oil good for you? ", "coconut oil and cancer" and so forth! This oil has been said to be linked to weight loss, smooth skin, long hair, acne-blasting, fat burning, sun-protecting cure all! Even the American Heart Association confusingly released controversial opinion about if this oil is a good fat that clears your arteries or clogs them... So which one is it? Coconut oil has been popular in the tropical islands for centuries where the palm trees are readily available. Tropical women- who live in this environment year round have smooth skin, long shiny hair, seem to be fit keeping their weight under control and never seem to get sunburns. How you ask? Because the people of these lands use coconut oil for EVERYTHING. That's right. Everything. 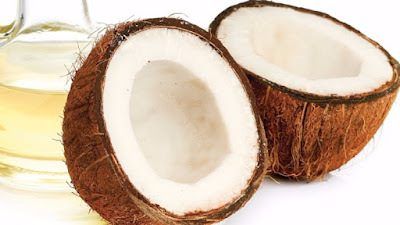 Coconut oil for acne, coconut oil for wrinkles, coconut oil for hair, coconut oil for skin, coconut oil for sunburn... I think you get the point. While commenced in my five years of research and development I studied this ‘miracle’ oil and the people of the islands, specifically the women who were exposed to it often and used it for everything. One of the countries I studied was India. Let us explore the example of a woman from India. Her hair is long, strong and shiny. Where does she get this beautiful blemish free skin? It is due to her use of coconut oil in her beauty routine. Since coconut oil has become popular in the US, this oil is the most talked about 'secret' in beauty and is growing more popular each day! This wonder oil is hard to keep a secret because of all the things it does. Medium chain fatty acids (triglycerides) are the saturated fats in coconut oil that lock in moisture on your skin and keep it beautifully smooth. These fats also eliminate moisture loss through the pores on skin. Coconut oil can keep you hydrated all day even through repeated exposure to water (such as constantly washing your hands). Coconut Oil is chock full of Capric, Caprylic, and Lauric Acid which is why it is a strong disinfectant and antimicrobial. When applied topically or internally, coconut oil protects from microbial infections because these fatty acids boost your immune system and act as a barrier against the pollution and debris your skin comes in contact with each day! This is also the reason coconut oil helps with acne, especially on the back, legs, and arms of body. The Vitamin E in coconut oil keeps skin from extreme dryness, cracking and protects against wrinkles and premature aging. 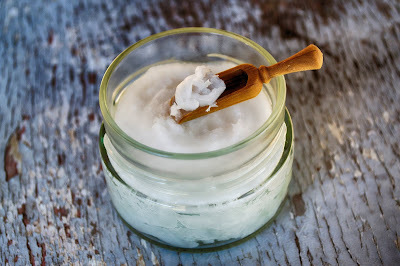 Coconut Oil's proteins aid the skin in tissue repair and rejuvenation at the cellular level. Bella Opulence only uses 100% Organic- Unrefined- Extra Virgin- Cold Pressed- Pure Coconut Oil. This may seem excessive, but this is the only type of coconut oil that is as pure as taking it from the nut of the tree. As with anything processed, when coconut oil becomes refined, or fractionated or chemically changed in any way, it loses its original healing properties, and does not function the same! The Lauric Acid that once kept acne at bay may have been removed during the refining process and is the reason your blemishes may not be going away. One way to tell of your coconut oil has been processed? It is solid until it reaches 75 degrees and it should have a vibrant coconutty smell. If it is liquid constantly, even in a cool environment and has no scent, it has been processed. We ensure our coconut oil's properties are intact so you receive the maximum benefit. What do you think? Myth or Miracle? You can find the blessed oil of coconut in EACH of your Bella Opulence products!